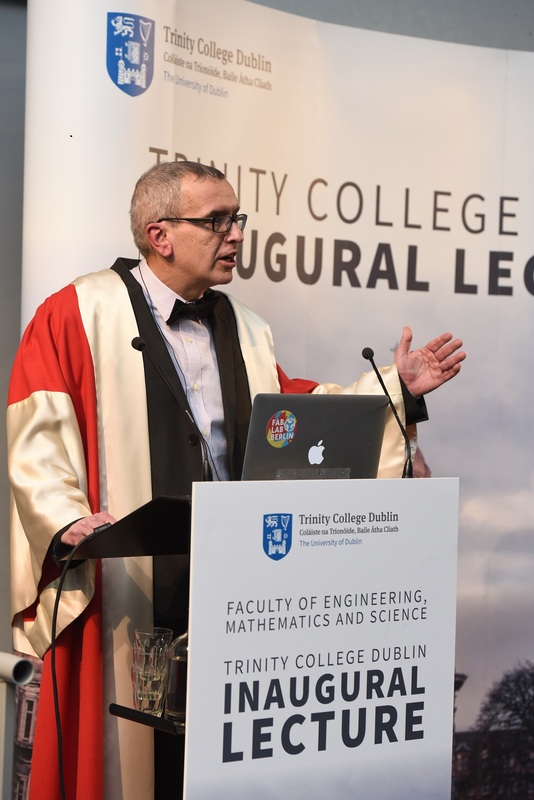 Professor Luiz DaSilva, Chair of Telecommunications at Trinity College Dublin and Director of CONNECT, has delivered his inaugural Trinity lecture. His talk, entitled ‘Cats, Hats and Wireless Networks’ was introduced by Professor Vinny Cahill, Dean of the Faculty of Engineering, Mathematics and Science. 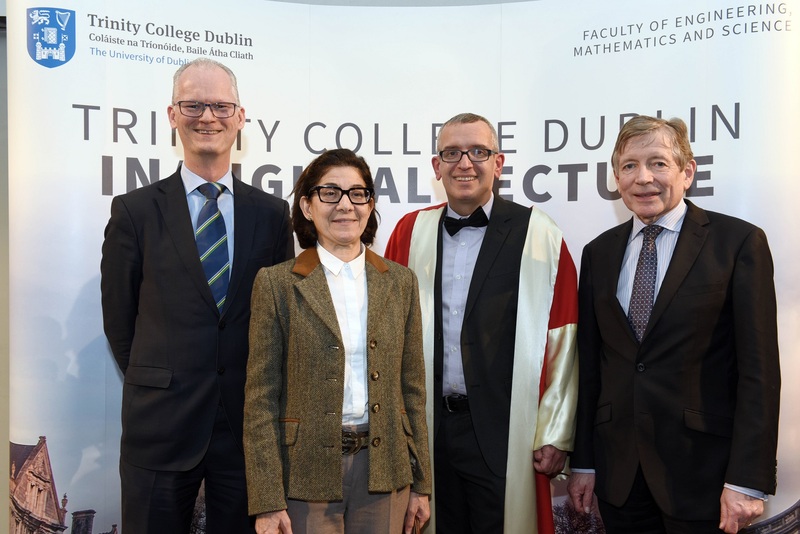 The lecture at the Science Gallery was attended by Professor Patrick Prendergast, Provost of Trinity; Mrs Eliana Zugaib, Ambassador of Brazil to Ireland; Professor Peter Kennedy, President of the Royal Irish Academy, and dozens of fellow academics, researchers and friends. Professor DaSilva’s lecture provided an overview of recent developments in wireless communications networks with a focus on his use of machine learning, stochastic geometry, and game theory in his research projects. Professor DaSilva was born in Brazil and spent most of his life in the US. After receiving Bachelor of Science and Master’s of Science degrees in Electrical Engineering from the University of Kansas, he worked for IBM for six years. He holds a PhD in Electrical Engineering and joined Virginia Tech as an Assistant Professor in 1998; he remained at Virginia Tech until 2014, most recently as a full Professor in the Bradley Department of Electrical and Computer Engineering. Professor DaSilva moved to Ireland to join Trinity College Dublin as the Stokes Professor in Telecommunications, and in 2014 was promoted to his current chair. Throughout his academic career, Professor DaSilva has taught thousands of students on topics including digital design, computer architectures, stochastic processes, and, telecommunications and networks. He has supervised 11 Master’s thesis and 16 PhD dissertations to completion; these graduates now work in industry and academic positions in the US, Korea, the UAE, India, and throughout Europe. Professor DaSilva’s PhD dissertation applied game theory to the analysis and design of quality of service differentiation in networks. For the past twenty years, his research has focused on wireless networks, including distributed and adaptive resource management in those networks, dynamic spectrum access and cognitive networks, and network virtualisation and sharing. Professor DaSilva currently serves as a principal investigator on research projects funded by Science Foundation Ireland, the European Commission, the National Science Foundation, and Huawei. He is the coordinator of the Horizon 2020 project FUTEBOL, which brings together six institutions in Europe and five universities in Brazil to develop research infrastructure for experimentation across wireless and optical networks. He is also the Director of CONNECT, the world leading Science Foundation Ireland research centre for Future Networks and Communications, which includes 300 researchers and €60 million in competitively obtained research funding. He is an avid runner and is currently training for his sixth full marathon. Professor Luiz DaSilva with Professor Peter Kennedy, UCD; Mrs Eliana Zugaib, Ambassador of Brazil to Ireland; and Professor Tom Brazil, UCD.